The Xperia ion has a 12 megapixel camera, complete with a single LED light. It's capable of producing images with resolution of 4000 x 3000 pixels, and packs Sony's usual panorama and 3D photo mode. The camera controls on the Xperia ion are available on two taskbars on either side of the viewfinder. On the left you get four shortcuts to various settings, while the still camera/camcorder toggle, the virtual shutter key and a thumbnail of the last photo taken are on the right. The menu key brings up two pages of extra settings: scenes, resolution, smile detection, geotagging, image stabilization and focus mode, among others. You can customize three of the shortcuts on the left (the shooting mode shortcut is fixed). The Xperia ion features a Quick launch option, which lets you customize the phone's behavior upon a press of the camera key when the phone is locked. The default option is Launch and capture - it unlocks the phone, starts the camera and instantly snaps a photo - a rather uncomfortable choice because it's nearly impossible to correctly frame a picture before the screen is on. This usually produces images with motion blur. The other option is to just unlock the phone and start the camera, or you can disable the feature completely. The hardware shutter key on the Xperia ion does a good job. The phone itself is comfortable to hold. Still, pressing the shutter key all the way down requires too much effort for shake-free shooting. The Sony Xperia ion may have a 12MP sensor, but from where we see it, it's more of a marketing gimmick than a real-world advantage. The image quality is actually nice, but only when you view the photos without any zooming. In fit-to-screen mode on our 1080p monitor, the photos looked nice and lively, perhaps just a bit oversaturated, but generally pleasing. Zooming in to 100%, at pixel-per-pixel level, we see a different story. The photos produced by the Xperia ion have above the average noise levels even in broad daylight. The resolved detail is not more than the one offered by the better 8MP cameraphones (well, perhaps the macro shot of the wrist watch being the only exception). And finally, on all photos the foliage in the trees have an unnatural watercolor look, which most of the 8MP competitors get right even at 100% magnification. It's the result of the Xperia ion's uneven struggle with the noise. Noise reduction algorithms take their toll on the fine detail and grass and foliage is usually where it gets hit first. Unfortunately, though it may seem that the Xperia ion is an imaging-centric device, the reality is it only has an average camera and it looks Sony engineers have not put much effort into it either. The Sony Xperia ion camera offers 1080p video capture @ 30fps, matching what we saw in the Xperia S. The camcorder has similar settings to the still camera, including focus mode, metering, exposure value, image stabilization and so on. The layout of the shortcuts can be customized here too. 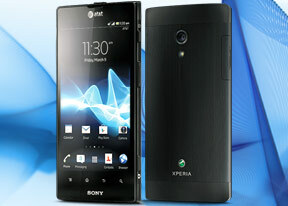 Video is probably a department where the Xperia ion can redeem itself of the average still performance. Unfortunately, most of the video we shot with it came out focused at a closer distance than we would have liked, eventually rendering slightly out of focus everything further than 5-10m. As a result videos from the likes of the Samsung Galaxy S III have stunningly more detail than those of the ion. The good thing is you can only tell the difference when you compare those head to head. On their own, the Xperia ion videos look as good as any other recent cameraphone. So the videos by the Xperia ion turn out slightly better than average but nothing to write home about. Check out the video samples we captured with the Xperia ion below. If you want to look closer at the video quality, you can download this untouched 1080p@30fps sample, taken straight off the device.